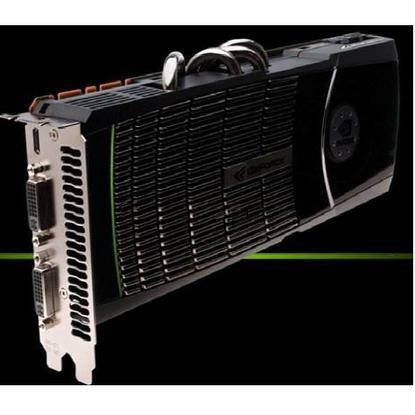 Priced at US$500, the GeForce GTX 480 is squarely aimed at... no competing product. The obvious target would be the reigning graphics card champ, ATI's Radeon HD 5870 -- but that card can generally be found for about $400. The 5870's bigger brother would be the next logical step, but that's a dual-GPU card, and it typically falls into the $700 range. While not indicative of real-world performance, synthetic benchmarks are a generally accepted industry standard, and can help us get an general idea of how these graphics cards will perform in the wild. We started with a look at graphics tests using Futuremark's 3DMark Vantage. 3DMark offers a pair of DirectX 10-based game demos, which emulate a typical game's strain on a graphics card. One test emulates an indoor action sequence, simulating cloth, light and water reflection, and static object rendering. The second test takes place in outer space, simulating shadow-mapping, and rendering large scenes consisting entirely of moving objects. The scores were close: the GTX 480 saw a negligible 0.1 percent gain over the 5870, while the overclocked R5870 took the lead with a gain of almost 4 percent over the GTX 480. For our final synthetic test, we used FurMark -- an open-sourced, OpenGL benchmarking tool. It's tests are based on fur-rendering algorithms to test, and place rather extreme levels of pressure on a GPU in the process. Our tests were conducted at a resolution of 1920-by-1200 pixels, at 0x-, 4x-, and 8x-multi-sampled anti-aliasing. As our handy chart shows, the GTX 480 lead the pack, followed by the overclocked 5870. Where FurMark does excel, however, is in giving us a good idea of what these cards would look like when operating at their upper limits. During a minute-long FurMark run we saw the GTX 480 get as hot as 95 degrees Celsius -- that's 203 degrees Fahrenheit. Our stock HD 5870 peaked at 75 degrees Celsius (167 degrees Fahrenheit), while the overclocked R5870 Lightning reached 78 degrees Celsius (172 degrees Fahrenheit). Whether or not the GTX480 is worth your hard-earned funds will boil down to practical concerns. Across our gaming tests (synthetic benchmarks excluded), we generally saw a 15 - 20 percent performance gap, with the GTX 480 sitting ahead for most of them.